Padang is a large Indonesian city on the west coast of Sumatera, famous for its food culture including its best-known export, “Padang” style fast food restaurants. 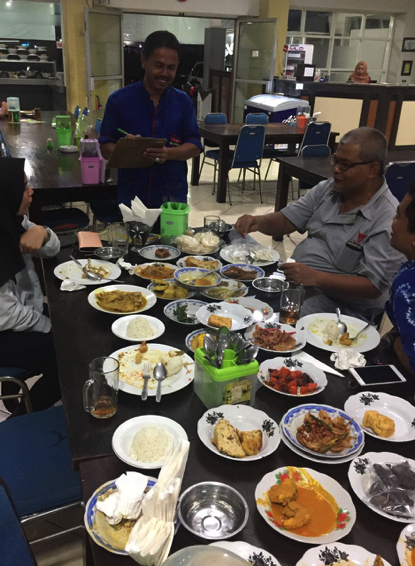 This type of food outlet is probably the largest food service model in Indonesia with many hundreds of thousands of restaurants from large corporate chains to very small family businesses spread throughout the entire archipelago. The model is very simple. A wide range of dishes are created with modest portions of each placed on many small plates. See below, the large number of small plates stacked up on the front counter of the shop ready for serving. The food is served cold while the rice is served hot. Once the customers walk into the shop and sit down, the waiter begins to bring a large selection of these dishes to the table along with bowls of rice and mugs of hot tea. 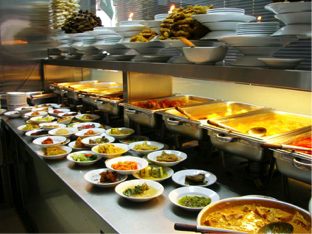 Literally, about 30 to 60 seconds after sitting down, you are presented with a table full of dishes ready to eat. 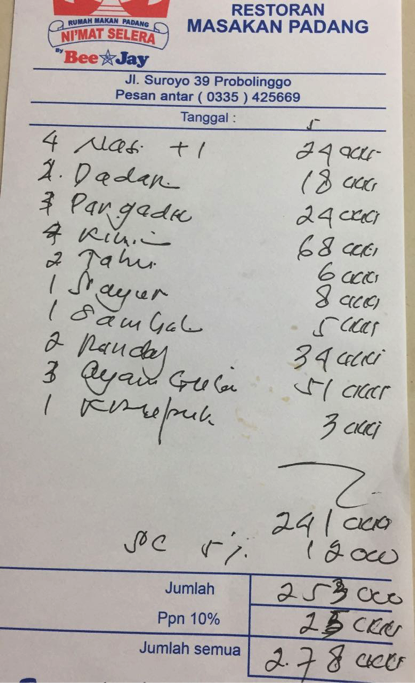 The photo below shows food provided for 4 people. Spoons and forks are available but most locals prefer the traditional approach and eat with their fingers. Note the silver finger bowls. Photo : chicken, fish, beef, goat, vegetables, curries, soup and omelet in a wide array of cooking styles with something to suit everyone. If you especially like a certain dish then additional plates can be provided in seconds. Cut fruit for desert is optional. Here is the twist. Once everyone has eaten their fill, the waiter comes to the table with his note pad (photo below). He scans the table with a practiced eye and tallies up what you have eaten. The customer is only charged for what is missing from the small plates with the remaining food returned to the front counter to await the next customer (if not eaten) or be replenished if partially or totally consumed. Yes, the food returned from my table is re-presented to the next customer. This lack of waste is what allows the prices charged for this form of food service to be kept so low despite the vast array of dishes being presented for consumption. Some foreigners, unfamiliar with this style of food service, are horrified that the food you are being offered may have just been returned from the previous customer’s table or perhaps has been sitting on the front counter since yesterday. While I understand these sentiments, there are ways to ensure that your food is fresh by only visiting busy outlets where food is rapidly used up and constantly replaced with fresh product. Observing the standards of hygiene practiced in the establishment provides a useful clue to the safety of the food on offer. Looking for restaurants favoured by large numbers of passing truck drivers is also a good indication of quality, value and food safety. After some years travelling widely in Indonesia I have to confess that this is one of my most favourite local eating styles. The food is generally delicious and the selection is huge. With appropriate selectivity there is no better, faster or safer way to eat well while travelling. And no, I have never had a dose of “Bali Belly” following a visit to a Padang restaurant. I can’t say the same from conventional restaurants. Padang also provides for fast, tasty and economical take-away. Photo : Identifying what dishes have been fully or partly consumed is quite an art for the waiter to master. Customers often join in the analysis to explain what they had so everyone is happy with the bill. The bill below shows that the meal in the photos above cost about AUD$28 for 4 people including 10% VAT and a 5% service charge. All you can eat for $7 per head is hard to beat. The third item from the bottom of the bill is 2 x rendang @ 34,000 Rp or about AUD$1.70 for a plate with two lumps of rendang beef in spicy sauce. I probably ate them both. 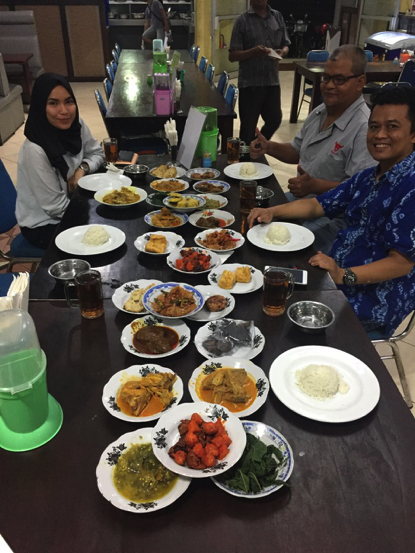 This type of low cost retail outlet is where a large proportion of the Indian buffalo beef will end up although I enjoyed this meal in a rural town in East Java with the locals telling me that buffalo beef has not yet reached that far. Rendang originated several hundred years ago in the Minangkabau district north east of Padang. This cooking technique flourished because of its role in preserving meat in the tropical climate as well as its delicious flavour. Along with the main meat ingredient, rendang uses coconut milk and a paste of mixed ground spices including ginger, galangal, turmeric leaves, lemongrass, garlic, shallots, chillies and other spices. Cooked properly, dry rendang can last for as long as four weeks without refrigeration. The meat used is traditionally beef but is sometimes substituted with lamb, goat, chicken and offals.